This Cyrille bedroom collection features a rolled upholstered polyurethane headboard. 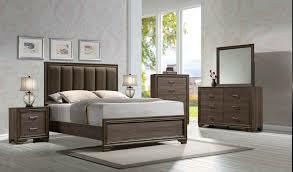 The soft sensuous curves of the padded headboard plus the clean, restful lines of the group add to the quiet soft walnut finish to create a simplicity that reverberates class. The wooden handles add a tactile simplicity to compliment the beautiful lines of this group.